Atomic foosball tables are known for their unique foosball man design. They are a new table design that has just recently come on the foosball scene. Instead of having a head like traditional foosball men, the Atomic man design has 2 feet, called a "hammerhead", to maximize the functionality of the players. This allows the men to be counterbalanced and also opens up the door to some interesting new ball control skills and tricks. 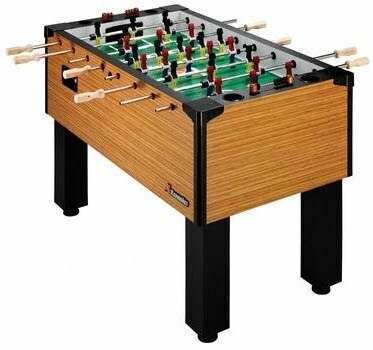 The AS2 foosball table is the highest quality table that Atomic manufacturers with a more sturdy cabinet design. However, we recommend purchasing a Tornado table because the Atomic foosball men are not approved for tournament play. This foosball table is priced at around $900 US.